The City of Ravenna has been the centre of the world for several centuries, first as capital of the Western Roman Empire, with Theodosius King of the Goths, and then as centre of the Byzantine Empire, which considerably changed the architectural shape of the city, enriching it of monuments and mosaics. Ravenna is considered to be one of the most interesting cities of Emilia Romagna, with an impressive complex of early Christian and Byzantine monuments. Piazza del Popolo is the focus of the historic city center. On it is Palazzo del Governo, now the prefecture, which encompasses two thirds of the square. It is faced by Palazzo del Municipio which has two Venetian granite columns. 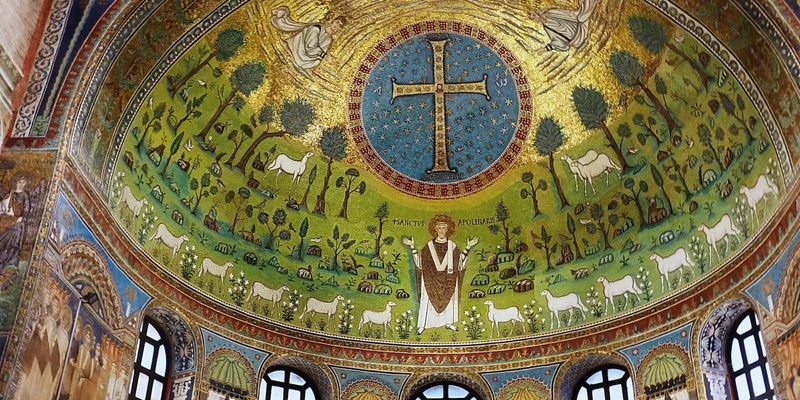 Ravenna also has one of the finest constructions of the early Christian period, the Basilica di San Vitale. 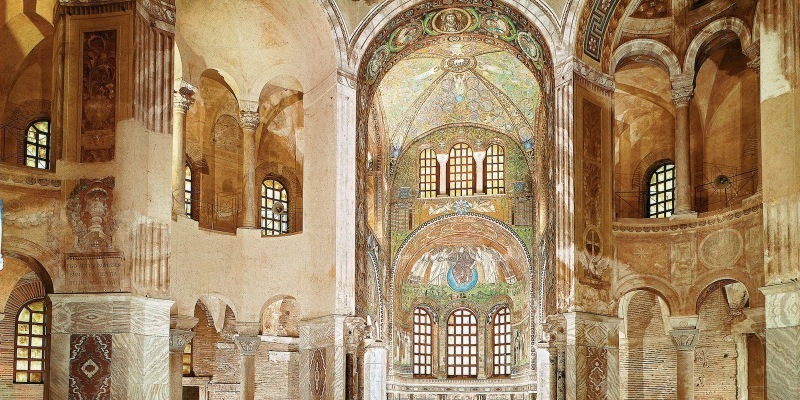 Its interior is lined with marble and mosaic decorations, such as for example the wonderful gold and bright green Byzantine mosaics of the apse. Nearby stands another masterpiece, the Mausoleum of Galla Placida, with a very simple exterior in contrast with the richness and harmony of the inner mosaics in vivid peacock blue, moss green, gold and orange. 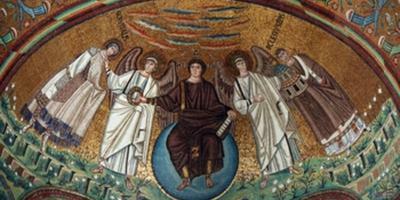 Also, in the Monastic Complex of San Vitale the National Museum complements the cultural and artistic heritage of Ravenna with Roman ruins, 14th century frescoes and collections of fabrics and ivories. The Arian Baptistery is an integral part of the early Christian Ravenna with its octagonal shape and splendid mosaic in the dome. Coming back toward Piazza del Popolo, not too far away, is Dante’s Tomb, a little temple in neoclassical style which preserves the remains of the Italian poet par excellence, who died in Ravenna in 1321. Very important is also the Basilica di Sant’Apollinare Nuovo, with the beautiful cylindrical bell tower on the right side and the interior decorated by mosaics of great brightness, some in classical style, other in Byzantine style. Not to miss also the Neonian Baptistery, considered one of the most ancient and best preserved monuments of Ravenna together with its wonderful mosaics, and the Mausoleum of Theoderic, out of the historical centre, the only monument of Ravenna without mosaics. They have been attested as World Heritage by the UNESCO. An interesting itinerary out of the city leads us to the Basilica di Sant’Apollinare in Classe, with a cylindrical bell tower and elegant columns surmounted by Byzantine capitals and mosaics. Not far from Sant’Apollinare in Classe extends itself the Pinewoods of Classe, which include also the Pinewoods of San Vitale and Cervia, integral parts of the Regional Park of the Po River Delta. Still on the coast, Cervia is among the most appreciated holiday resorts, which, beyond its touristic vocation, is rich in shows and events. Northwards on the coast one reaches Milano Marittima, one of the most popular seaside resorts of the coast of Romagna, with a great number of clubs and restaurants. Towards the east there is the sea district where writer Grazia Deledda once resided; the city raised a monument in her honor. The hinterland surrounding Cervia and Milano Marittima is characterized by the waters of the very ancient salt-pan and by the famous Pinewood of Cervia. After Marina di Ravenna, going up along the Adriatic towards Venice, you will meet the characteristic fishing boat centre of Porto Garibaldi, a lovely holiday place. 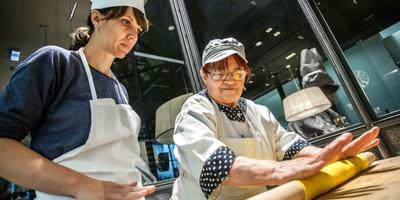 The city of Faenza is famous all over the world for the ancient majolica tradition and traditional ceramic work. In 1908 the International Museum of Ceramics was dedicated to this art, and then rebuilt as consequence of the last world war. In the town of Russi there is the archaeological area of the Augustan age Roman villa. In nearby Lugo we have a Pavaglione, recalling past eras when this huge four-sided portico held the silk-worm cocoon market. The city offers its visitors an easily walkable and reachable city center in few minutes by public buses. They have their stop in front of train station and in Piazza Caduti per la Libertà. Nearby towns and especially seaside localities are connected to Ravenna by regular buses departing from the train station or piazzale Aldo Moro. The ferry transport service connecting Marina di Ravenna to Porto Corsini via the Candiano Canal is operated by START Romagna. The transport service runs every day at the times indicated below. In case of bad weather or other exceptional conditions, the transfer of pedestrians from one bank to the other is guaranteed by bus. All information (timetables and prices) about the service is shown at the embarkation points.